Notes: Cards are blank-backed. No mention of De Beukelaer anywhere on cards. I have seen a complete set of these in color, obtained from England. 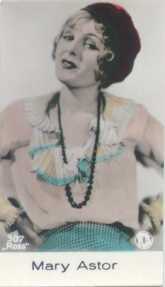 I have also seen card #395, Norma Talmadge, in black and white, obtained from Belgium. It is likely that all of these cards can be found in black and white as well as color versions.